The wait is over! 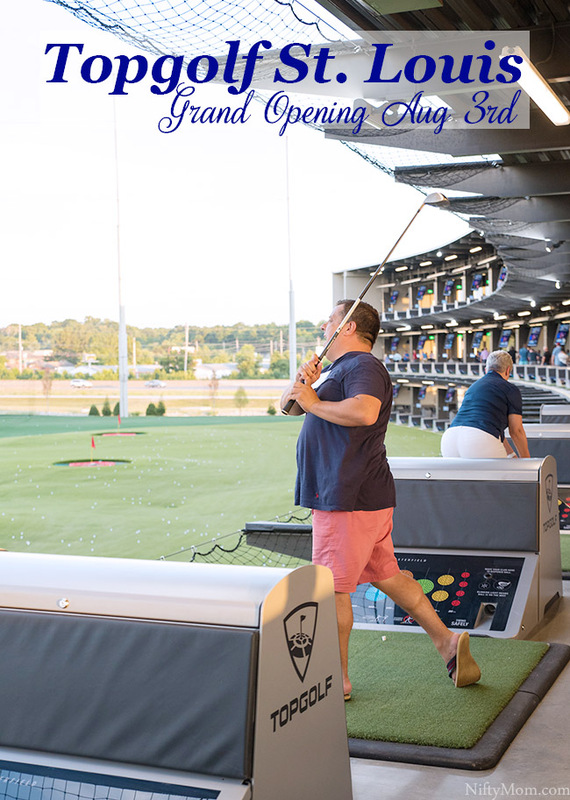 Yesterday Topgolf announced their grand opening: Friday, August 3rd at 9am. I had a chance to check it out last week and let me tell you, it was phenomenal and by-far exceeded my expectations. If you have driven down Highway 40 through Chesterfield in the last 6+ months, I am sure you have noticed the construction of the large Topgolf facility on the outer road. With the large high nets, my kids were highly curious, as well. When I explained to them what they were building, they all insisted I take them after it opens. 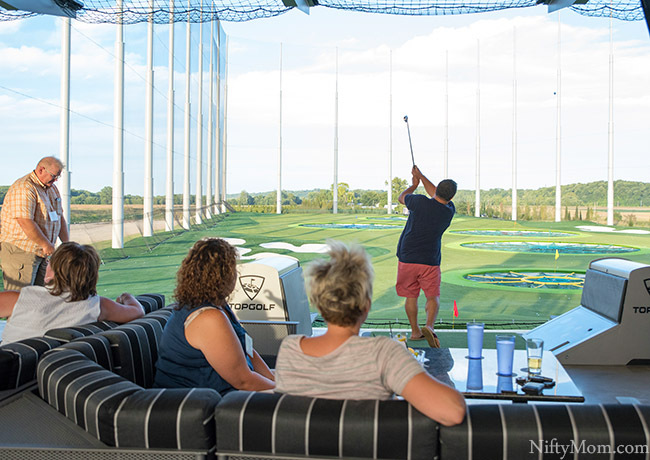 At the time, since this is the first Topgolf location in Missouri, I was unsure just how kid-friendly it was. When I visited last week, I asked lots of questions to get the scoop and I will get to that a little further down. 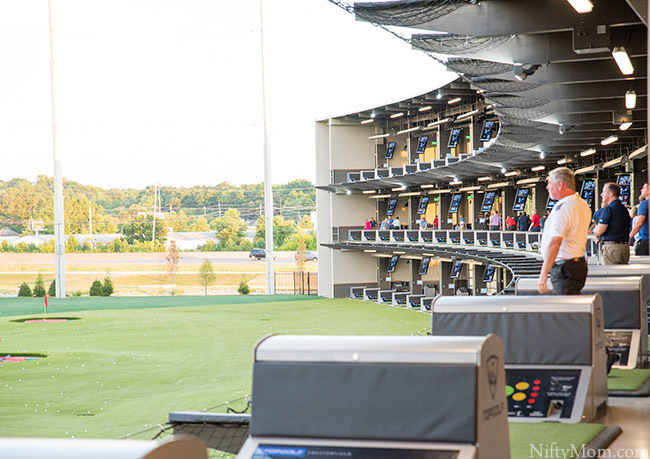 First, let me tell you a little more about Topgolf in general and what to expect when you go. Similar to a bowling alley, your group will get assigned to a bay (instead of a lane). There are 102 bays total between the 3 levels. Each bay can accommodate eight guests, however only six can play at a time. Your party will rent the bay by the hour (price varies depending on the day and time). Reservations can be made online here, but many bays are set aside for walk-in guests. 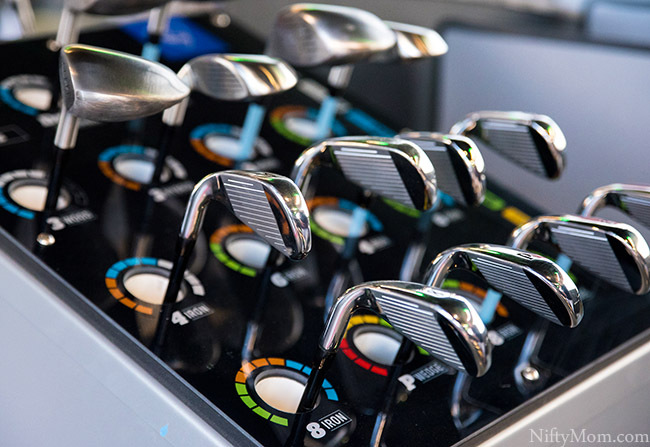 Guests are more than welcome to bring their own golf clubs, but each bay is stocked with a variety to use. There are about eight different games that can be planned (more on those here). 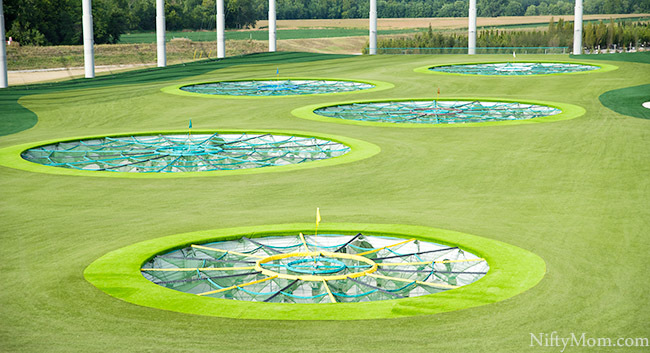 The overall goal is to aim and get the ball in the various targets throughout the field, which look like flags in the middle of sectioned trampolines (they are nets). 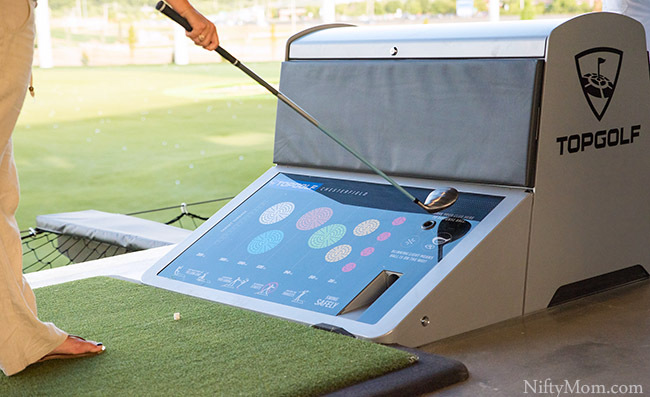 When it is your turn, you take your club choice to the tee, wave it over the sensor and a golfball will roll out. Each golf ball has a chip in it to give real-time tracking so you know exactly where you hit it to keep track of how many points you get. On the bay screen, it will light up the area you hit the ball, if it was in a target area. Now let me be real with you, I have never swung an actual golf club before my visit to Topgolf. Never. It was intimating at first. A very kind staff member showed me how to hold and swing the club, which was helpful. After a few (or more) tries, I got the hang of it. I was consistently hitting the ball off the tee and grew confidence with each drive. It was extremely exciting and we were having a blast laughing and cheering the whole time. 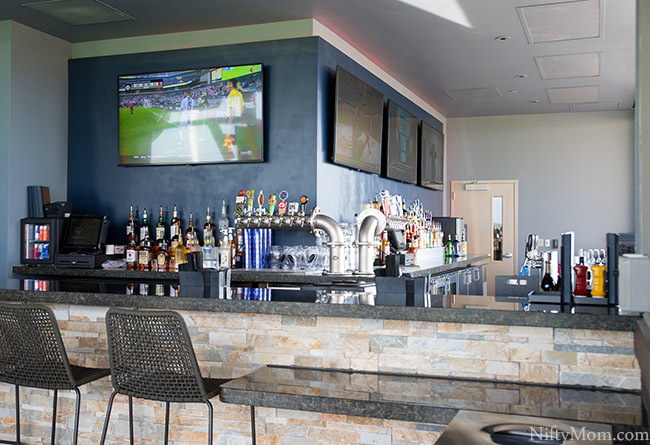 When you aren’t swinging, there is comfortable seating in the bay to enjoy drinks, food, and converse with your friends. What else can you expect at Topgolf? Indoor lounge area with pool tables. Each outdoor bay is climate-controlled with large overhead heaters that can make the bay about 30 degrees warmer than the outside temperature, so it is not just a summer activity. They have small golf clubs just for kids, available upon request (they are not stocked at each bay). You can even purchase their Kids Clubs so your little one has their very own set. They offer a family fun pass in the summer, which would be a great idea next year. The food menu even includes a kids section. They offer kids clinics and coaching just for the kids. 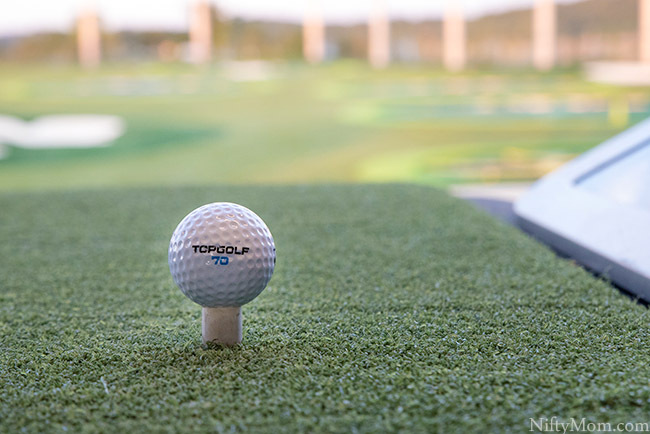 Topgolf also has a variety of events and activities for kids that are announced throughout the year (think cookies with Santa). They have birthday party packages for kids 12 and younger. 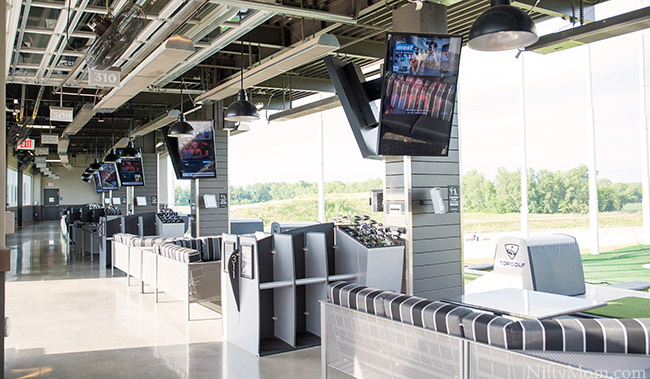 Sign up your kids (12 and younger) for Topgolf’s free KidZone to stay up-to-date on their events and get a free kids meal on their birthday. 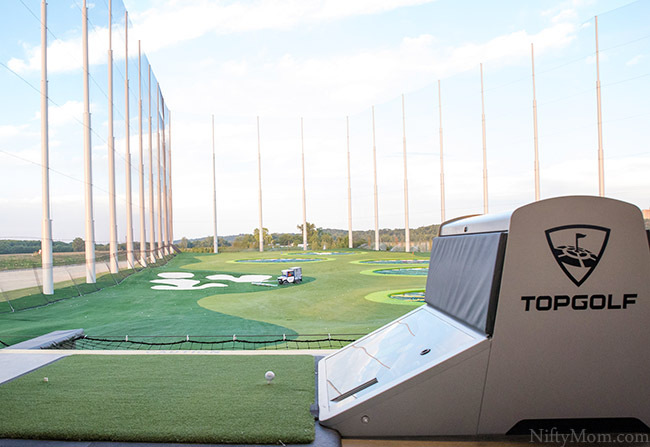 I look forward to making memories at Topgolf with my friends and family. 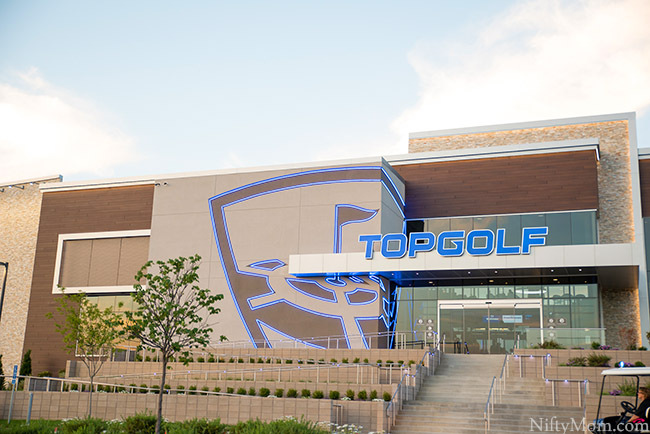 For more information and details, browse Topgolf.com and follow their Facebook page.